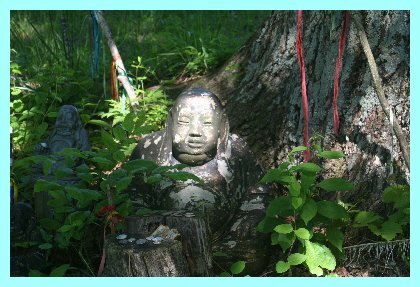 Tibetan Buddhism has been called “the world’s most complex religion.” Whether that label is true depends on a subjective judgment, but there is no question that it is not easy to find your way through the many different layers of traditions that have been assembled and shuffled in the process of developing the form of Buddhism that we call “Vajrayana” today. As a matter of fact, it would be best for us to back off from the purely Buddhist side for a few moments and look at “Tibetan religion” as a greater whole, of which Buddhism certainly is the largest part. Nowadays we find three religions with official labels in the area of Tibet. Of those, Islam represents a small minority and need not be treated further on this site, not because it would not be significant in its own right, but because it has not fused itself with the other parts. The other two are Buddhism and an indigenous religion called Bön. We shall consider Bön in more detail on the next page. 1)	To what extent the original religion (pre-Bön) resembles the present religion called Bön. 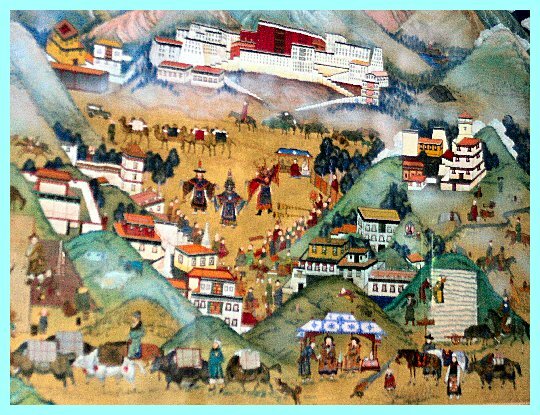 2)	To what extent animistic and magical practices in Tibetan religion are the direct continuation of aspects of Bön, and to what extent they are an independent further trajectory of Tibetan religion. “Animism” is the veneration of many spirits inhabiting the universe, and “magic” is the attempt to manipulate such forces by ritual actions. Let us save responding to the first concern for the next page and comment on the second issue. There are very few (if any) religions in the world in which a segment of the population does not engage in animistic practices. Sometimes they are considered to be heretical (e.g. in Islam or Christianity); sometimes they are integrated into the religion (e.g. in Hinduism). In Tibetan religion, spirits—both good and evil—play an important role, but there is no good reason to ascribe them specifically to the pre-Bön heritage. As a matter of fact, the form of Buddhism that became dominant in Tibet, namely Tantric Mahayana, by itself lays claim to magical practices and techniques to protect against malicious spirits. Those people who are adept at manipulating the spirit world of animism frequently play the role of a shaman. A shaman is someone who makes direct contact with the spirits, often by allowing himself to be possessed by them, and thereby giving help to individuals as well as the community by disclosing the will of the spirits to them. Buddhist and Bön lamas (monks) both act as shamans; on the whole, they may be more dominant on the Bön side. Lay persons can be shamans as well. Tibetan shamans frequently perform ceremonies that may last several days, in which they dress up in various costumes to perform their rites. 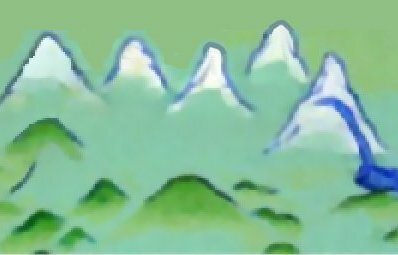 If you run your mouse cursor over the picture on the left, you will see an artificially produced highlight of the three shamans in the original Tibetan painting. 1)	The general pattern of beliefs that characterizes most religions emanating from South Asia: The entrapment of the individual in the seemingly never-ending cycle of rebirths (samsara), which is propelled by the consequences of one’s actions (karma), and the search to escape this cycle by means of some form of release (moksha), which in Buddhism takes on the form of enlightenment and Nirvana. 2)	More specifically the teachings of Tantrism as they evolved in some versions of Hinduism and produced their Buddhist counterparts. Finally, we cannot forget about yet another component, which usually goes without a name. The idea of a “nameless religion” is not farfetched because in many cultures, until there is some external pressure for distinctive labeling, it simply passes as common sense and shared beliefs throughout a community. We are thinking here of something more than animistic practices, but are including the worship of gods and goddess, as well as actions such as pilgrimages and the many means of making merit (again, more on this later) that have become associated with Tibetan religion. We shall give ourselves the freedom to give this religion the label of “popular” religion, not in the superficial sense that it is practiced only among the lay populace, which would be just plain wrong, but in the technical sense that it is a set of traditional, rather than prophetically proclaimed or inscripturated, beliefs and practices. There appears to be good reason to believe that much of this popular religion is a part of the heritage of original pre-Bön, and we will tentatively make that assumption because it is reasonable, but we must also realize that there is no direct evidence for that connection. of sacred mountains and sacred groves. Please recognize that these different components all have blurry edges around them. It is not hard to distinguish between core Buddhist factors and purely shamanistic practices, for example, but it can be quite difficult to pinpoint where one leaves off and the other one picks up because in the minds of the practitioners, the distinction does not exist. They simply practice their religion and assume that all of what they believe and do is a part of a single, indivisible cloth. 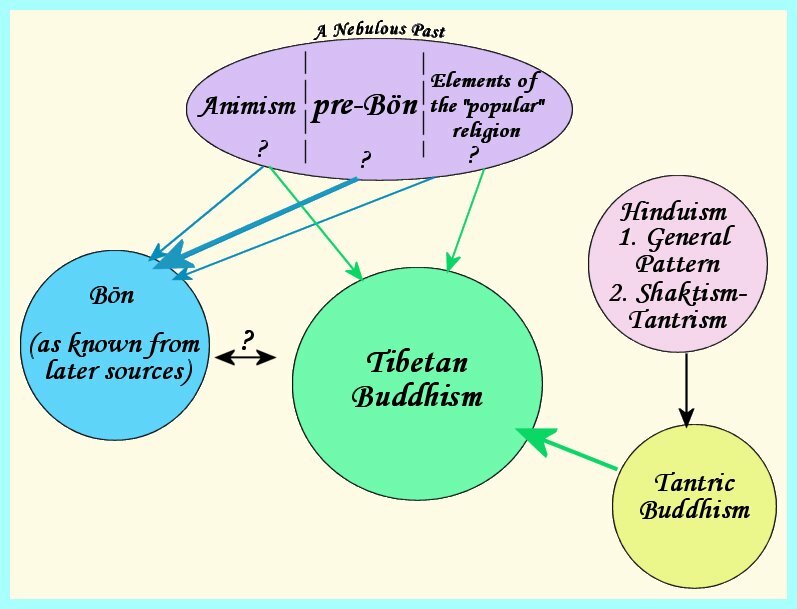 The diagram below is one way of attempting to reconstruct the various influences in Tibetan religion and, specifically, Tibetan Buddhism.